Bouchard, A.M., McNeil and Brodeur, J.N. 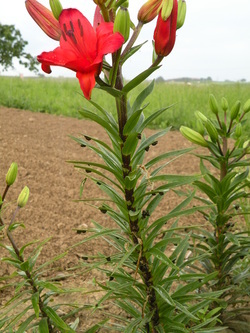 (2008) Invasion of American native lily populations by an alien beetle. Biological Invasions 10, 1365–1372. Ernst, C., Cappuccino, N. and Arnason, J.T. (2007) Potential novel hosts for the lily leaf beetle Lilioceris lilii Scopoli (Coleoptera: Chrysomelidae) in eastern North America. Ecological Entomology 32, 45-­52.